Well, those 11,000 walnuts that I picked up just in the front lawn last fall were certainly a correct weather predictor. Since that was less than 2/3 of the crop, and already 10,000 more than last year, I knew it was going to be a cold, cold, cold winter. It’s been a good month to stay indoors and celebrate National Hot Tea Month, National Mail-Order Gardening Month, and National Oatmeal Month with cups of hot tea and oatmeal cookies, and a growing stack of seed catalogs to study on innumerable cold, cloudy days. Maybe I’ll make an oatmeal cake with caramel frosting to celebrate another birthday this month. I know I’ll be using my birthday check to purchase seeds! Valparaiso Garden Show: Jan. 27, 8 a.m.-4p.m. “Renovate! Repurpose! Revitalize!” One of Indiana’s largest garden shows, now in its 15th year. Held at the Porter Co. Expo Center, tickets $10. This show features speakers, Seed and Bulb Exchange, Garden Shed, garden photo contest, speakers, over 100 exhibitors and vendors of gardening products and more! Indiana Hort Congress: Feb. 13-15. This is a super show for anyone involved in farm markets or commercial crop production, wine, agri-tourism, food safety and organic or greenhouse growing. Attend the entire conference, or go for 1 day. The trade show is worth seeing for packaging, production machinery, wholesale seeds, irrigation equipment, etc. Schedule and registration available at www.inhortcongress.org.Held at Indy Marriott East. Fort Wayne Home & Garden Show: March 1-4. The 45th annual show, with gardens, vendors, speakers and more. Always enjoy the booth from the Fort Wayne Botanical Gardens for unusual items! Philadelphia Flower Show: March 3-11, 2018. Established in 1829, this amazing show quickly became the largest indoor display in the world, covering 10 acres with gardens and garden-related displays. This year’s theme is “The Wonder of Waters.” Tickets can be purchased on-site, but book your hotel room now to get one within walking distance. Kentuckiana Herb Symposium: March 24, 9-3. Always a terrific event, held at the lovely Plantation House at Huber’s Orchard & Winery in southern Indiana. This year’s theme is “Hoppin’ Good Herbs!” Delicious food, a huge array of items for sale, including herbal baked goods, plants and crafts.Lots of vendors, silent auction, and delicious food, plus a full day of speakers. Be sure to shop in the Orchard Shop afterwards! HSCI Herbal Symposium: April 14. One of my favorite days of the year.Great décor, food, speakers, vendors, silent auction and more.Hamilton Co. Fairgrounds, Noblesville. Visit the HSCI website for more info, or keep watching this space in future newsletters for more details. 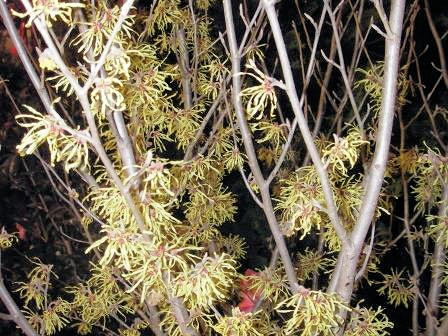 The Hamamelismollis of which she speaks is the Chinese witch hazel, brought to England in 1879. It quickly became a popular plant for its fragrant, very early bloom. One of its folk names is “winter bloom.” The photos above were taken at the Philadelphia Flower show two years ago. In the close-up on the right it is easier to see those ribbony blooms. Do not be hesitant to include this plant in your garden, wary of the term “witch” because it has nothing to do with wicked, warted crones. In olden days, inexpensive fencing was accomplished by growing dense shrubs and weaving the branches (wyches) together to enclose livestock and keep out intruders. When colonists came to the New World, the growth of the Hamamelis reminded them of that form, which led to its name. The fragrant, ribbony-yellow blooms of witch hazel are some of the earliest to appear, especially if given a sheltered easterly exposure. It can tolerate light shade, in fact prefers it in drier locations. Ideally it loves a loamy, well-draining soil, neutral to lightly acidic and grows happily in Zones 4-8. The large toothed leaves provide a dappled shade in summer and turn brilliant yellow in autumn. There are several varieties of witch hazels on the market, many of which are crosses to form interesting hybrids. The Chicago Botanic Garden has a trial now in its second year to see which ones are hardiest and perform best in terms of flower color, interesting leaf color, and fragrance. Check their website the end of February for their analysis. 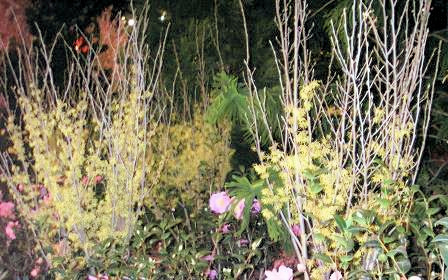 Colors range from clear soft yellow, to brilliant yellow, orange, red, and nearly purple blooms. Some flowers are compact, and some have longer, flowing ribbons of color. Also, some varieties actually bloom in autumn rather than early spring, but be aware that some bloom while their leaves are still attached, which makes the flowers difficult to see, so do your homework to choose which varieties will suite your zone and situation best. An astringent lotion distilled from witch hazel’s bark, twigs and leaves has long been used for centuries to soften skin, relieve insect bites, treat varicose veins, bruises and swelling. It makes an excellent alcohol-free skin cleanser and after shave.It is much easier to buy a bottle in the drug store than to distill your own lotion. However, leaves can easily be steeped in boiling water, which is strained used as a foot bath to ease sore feet. Witch hazel is a relative of the sweet gum tree, and fothergill shrubs. It is the birthday flower for August 9th, symbolizing changeability, consolation, inspiration and enchantment. Her husband, Stephen is the gardener, working hard to restore the extensive gardens around their lovely estate, built in 1911 overlooking the river and Louisville. After viewing all the main gardens, we had a lovely chat in the new kitchen garden that he had installed directly behind the house for Sue after she complained that the original kitchen garden was too far away. The original was located next to the carriage house, quite distant from the mansion as was common in those days. We discussed the cabbage loopers that were destroying his cabbages and kale, and I gave him a bottle of BT to solve the problem that luckily I had in my truck. I didn’t even suspect that on that lovely day, Sue was already battling cancer. She passed away a few weeks ago, Dec. 28, 2017. 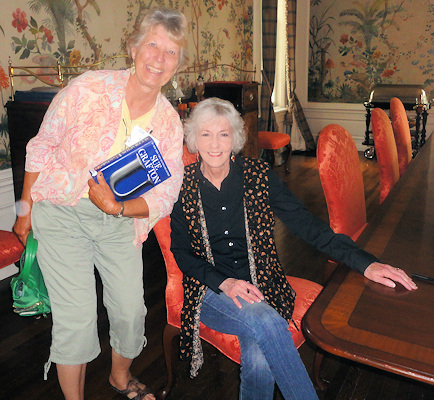 To see the article on my visit, and lots of beautiful photos of her garden, click on the June 2016 E-Newsletter. *A bit of vodka in the water for paperwhite bulbs will keep them more compact so they don’t flop, shorter, and happier. This is the only circumstance I know of where a little alcohol actually makes something less tipsy! This recipe was adapted from a presentation given by Chef Regina Mehallick at the 2017 Herb Society of Central Indiana’s spring symposium. I dug WAY too many carrots, and this is a delicious way to use them. It’s a new favorite! While carrots cook and cool, dice a medium onion, finely chop 1 medium jalapeño (or other hot pepper of choice) and mince 2 cloves garlic. 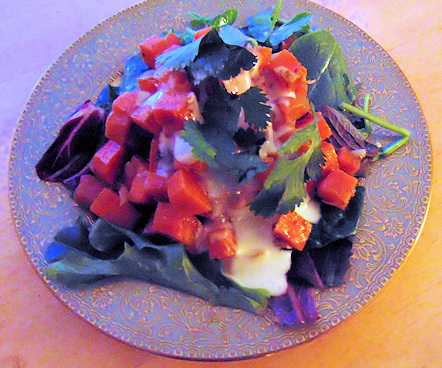 Heat ¼ c. salad oil in large skillet. Add the onion and sauté gently until lightly browned. Add hot pepper and garlic, stir. Cook for 2 min. Remove from heat. Add the following: 3 T. white wine vinegar, 1 tsp. ground cumin, 1 tsp. ground coriander (if you grind your own as I do, sift outer coating and discard it before measuring)1 tsp. paprika, 1 tsp. ground cinnamon, ¼ tsp. ground ginger, ¼ tsp. ground cloves. Stir well. Add carrots and toss until evenly blended. Allow to cool. Make a dressing for 4 c. spring greens or baby spinach by mixing 5 T. oil, 2 T. white wine vinegar, 1 finely diced shallot, a few grinds of black pepper and a dash of salt. Shake well and pour over greens just before serving. Hopefully Old Man Winter has had his tantrum, and will settle down for a gently nap until Spring arrives! Until then, don’t forget Mardi Gras is a chance to party, and Valentine’s Day will soon arrive for those who love chocolate or roses. Take any opportunity to celebrate!